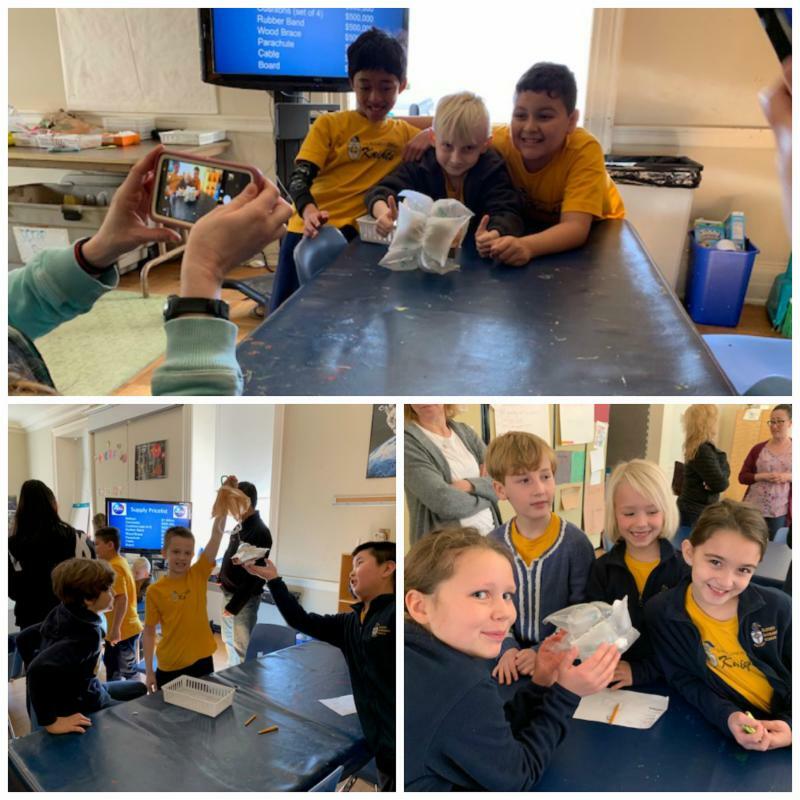 Blessed Sacrament School wishes to thank all of our sponsors, bidders, donors, faculty and staff and all who made our annual auction a success. 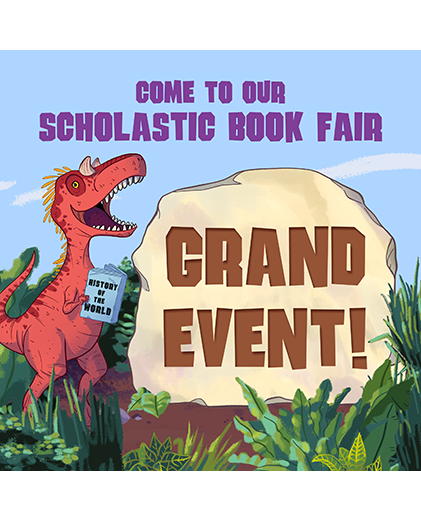 We are going to have a DINO-MITE time at our Scholastic Book Fair! The Book Fair is a reading event that brings the books kids want to read right into our school. It’s a wonderful selection of engaging and affordable books for every reading level. Please make plans to visit our Book Fair and be involved in shaping your child’s reading habits. 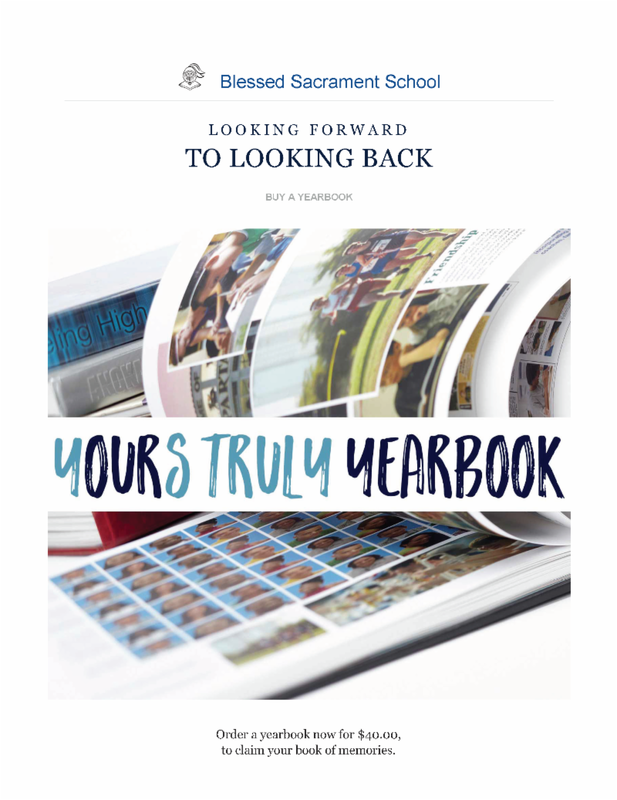 If you are unable to attend the Fair in person, we invite you to visit our online Book Fair at h ttp://www.scholastic.com/bf/blessedsacramentschool9 . 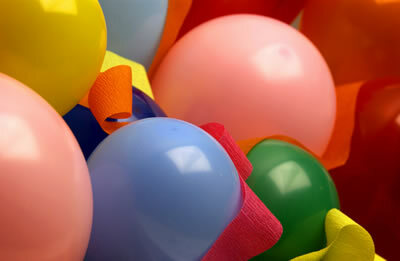 Our Online Fair is available from March 17th to March 30th. 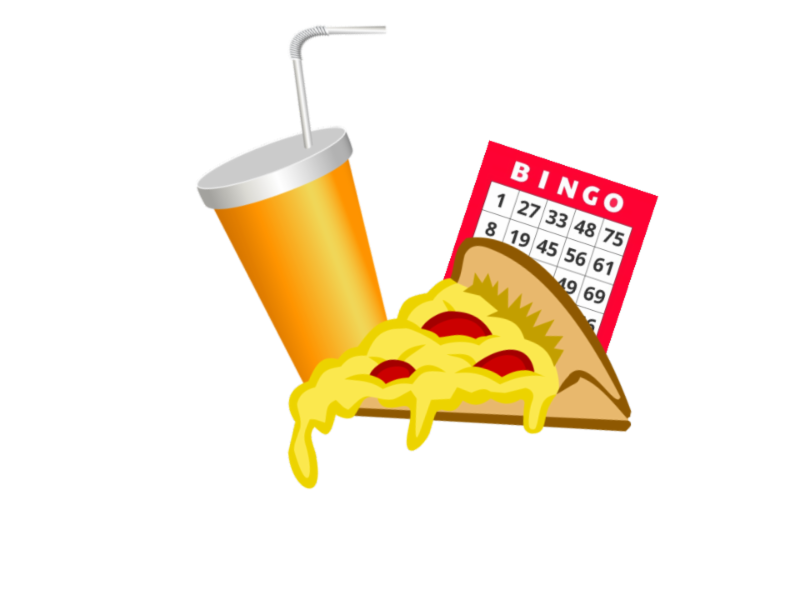 Come out and join us for a night of fun BINGO! Don’t forget to mark you calendars!! Order Forms are in the Wednesday envelopes today!! Need a night off? Four of out Middle School young ladies are offering babysitting services. They are all experienced and will work in teams of two. They will come to your home and will arrange their own transportation. All proceeds they earn will be donated to a medical charity to be determined. Their rate is $15 per hour per team. Yesenia (336) 512-8068 or Kathryn (248) 939-7893. Summer uniforms begins Monday, April 1st and our students have a habit of growing. Get your school uniform order into Lands End ( click here) or visit our Swap Shop which opens starting Monday, March 25th. Adrian Bishop, uncle of Mason (1st) and Julian (K) who is very ill due to flu complications. He has five children ranging from the ages of 20 through 3. The family needs the support of prayers. Mrs. Guzi, mother of Matthew (2nd), as she continues to recover from surgery. Thank you for a very successful auction! 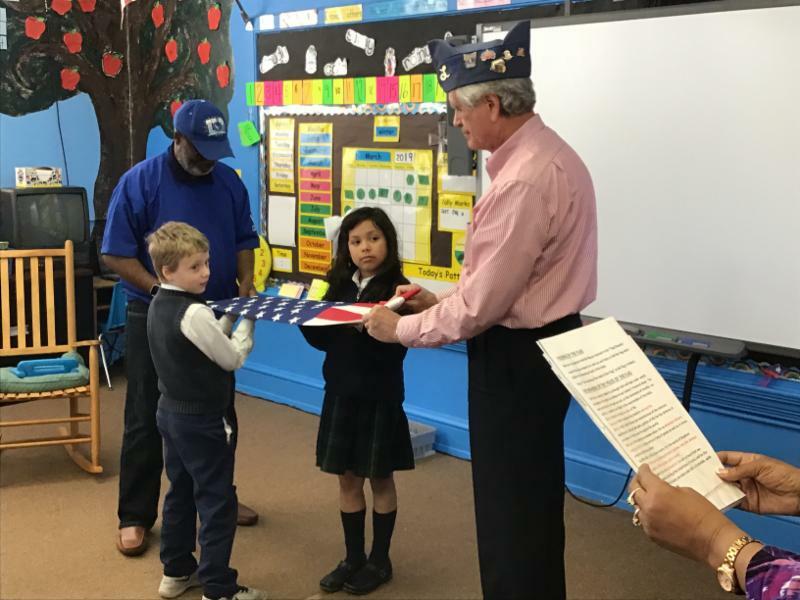 Four members of The American Legion and Alamance County Voiture 1237 taught first grade students about the American flag. We discovered which star on the flag represents NC. The veterans presented each of us with a small flag. 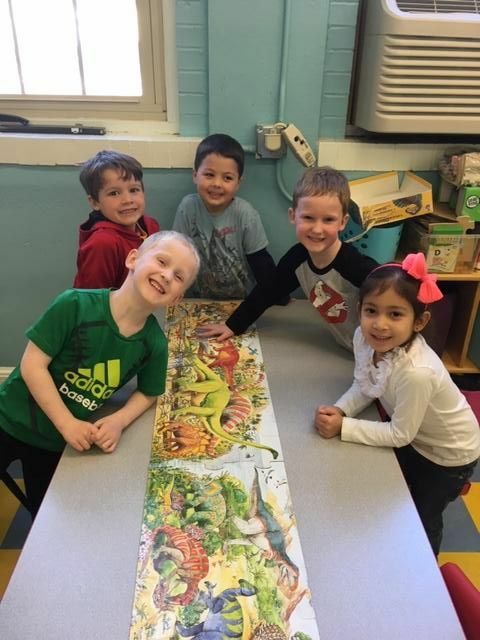 Our pre-K kids were so proud they finished this dino puzzle! 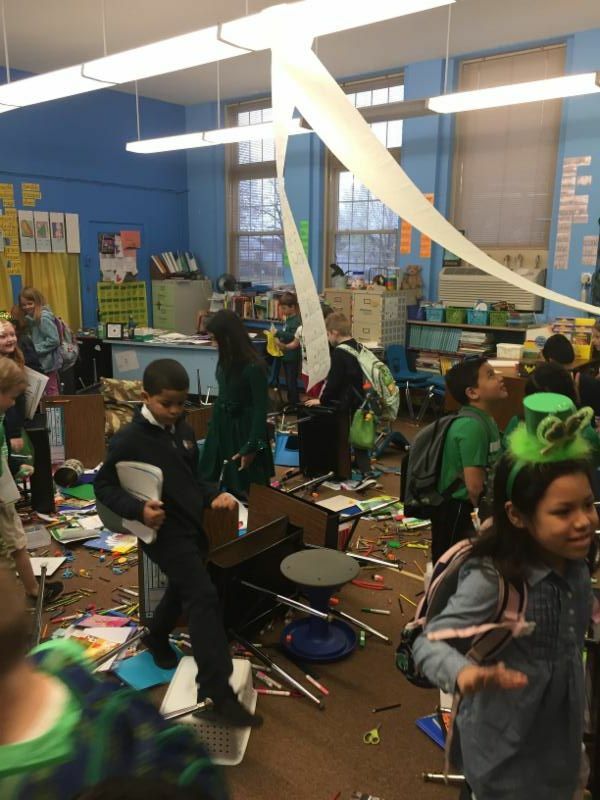 Last week we talked all about dinosaurs. 3rd Grade also enjoyed their visit to Morehead Planetarium. 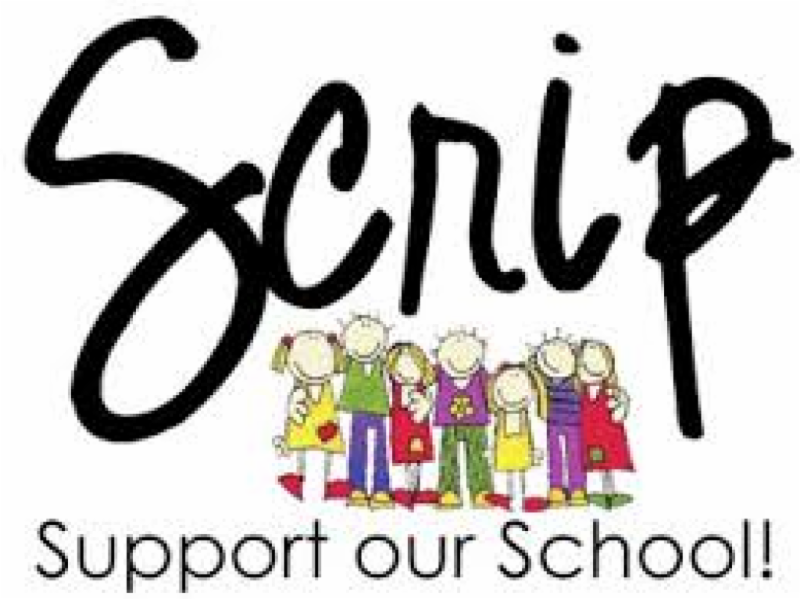 If you have friends or family members wanting more information regarding BSS Kindergarten, we will be at Holy Hill Mall from 9:00 AM to 12:00 PM to answer any of their questions. It will be a great opportunity to find out more about our wonderful school. Some nefarious international con artists are establishing and using email accounts, such as G-Mail, in the name of some of our priests and, most recently, in the name of our bishop. They are doing this to illicitly solicit gift cards, money or information. Kindly consider this as a scam and do not respond under any circumstances. Our diocesan IT staff is working to address this invasion of privacy and the attempted fraud against the goodness of our parish communities. To ensure your protection, if you receive a request from one of our priests or our bishop, please verify it is not a scam by speaking directly to them, or their appropriate staff, through known phone numbers and known email addresses. Please, never reply to such an email directly, nor call any numbers provided in such an email directly. I'm in a meeting right now , that's why i'm contacting you through here. I should have called you instead of mailing you , but phones are not allowed to be use during the meeting. I don't know when the meeting will be rounding up And i want you to help me out on something very important right away. I need to get an iTunes gift card for a friend of mine going through cancer at the hospital but I can't do this now because I’m currently busy. Can you get it from any store around you? I’ll pay you back. Let me know if you can get the card for me. God bless you. 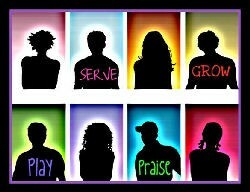 Our next time together is Sunday, January 6th from 6-8:00 at the church. 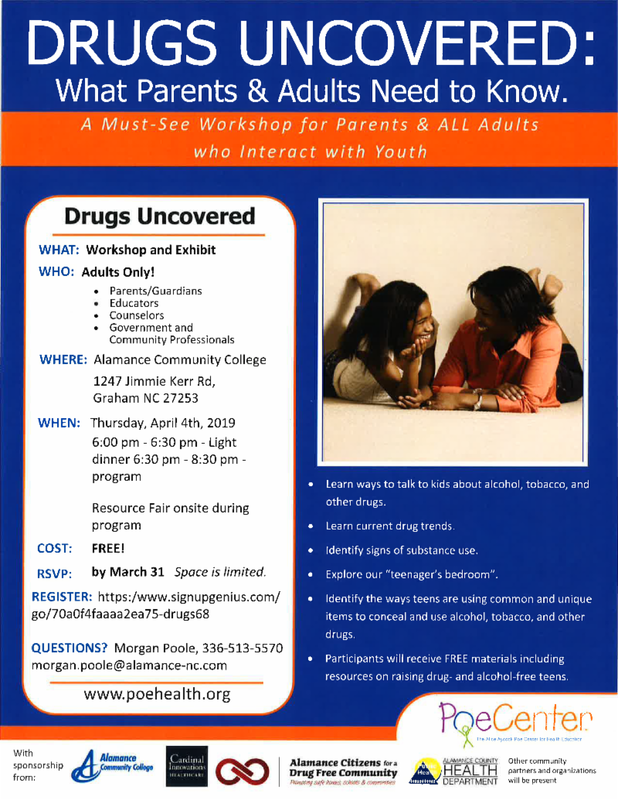 This event will take place on Thursday, April 4 from 6:00-8:30pm (light dinner served 6:00-6:30pm; workshop will start at 6:30pm). 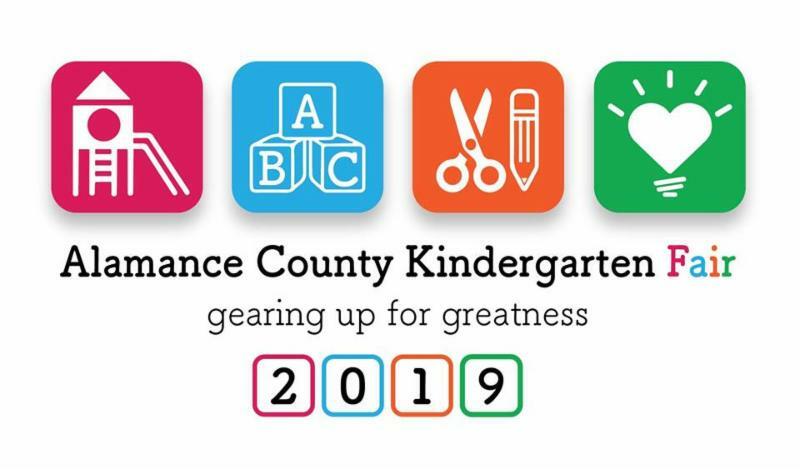 It is FREE and will take place at Alamance Community College.